Making a Ripple, Changing the World. 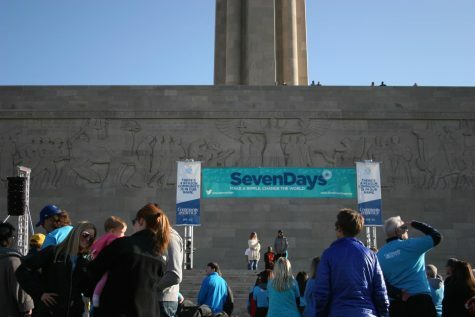 People gather from the Kansas City Metro Area to participate in SevenDays. Make a ripple, change the world. This is the goal of the SevenDays movement. On April 13th, 2014, Dr. William Corporon, Reat Underwood and Terri LaManno were murdered by a Neo-Nazi at the Jewish Community Center and at Village Shalom in Overland Park. This tragedy compelled Mindy Corporon, daughter of Dr. William Corporon and mother of Reat Underwood, to create Seven Days. Having lost both her father and son, Corporon felt that change was necessary. “We started SevenDays to create avenues of kindness and interfaith understanding for people, so they have the opportunity to learn about others in a fun environment,” Corporon said. The movement focuses on a ripple with seven rings, three left blank to commemorate the lives lost. Each ripple signifies a day and an important lesson. The whole movement centers around the ripple “Make a ripple, change the world” being its mission statement. The main objectives are love, awareness and action. Each ripple and day of the movement then fits under one of the seven categories. Love. The first day is centered all around love. Love is powerful and affects people in many ways. Those participating in the “Love” day learned about the chemistry of love and how people react to it. Kicking off the week, a panel of leaders from different religions met to discuss the day’s theme. Discover. The “Discover” day encouraged people, especially students, to seek out and meet new people. Through the activities, people realize they are more alike than they are different. People were encouraged to attend the community-wide “discover dinner”, in order meet and to learn more about fellow community members. Others. Focusing on the importance of others, participants learned to cherish and support each other. Compliments and cheers were used in the day’s activities. Any act of support helps to create and more welcoming and kind environment. This day’s event featured a talk with Valarie Kaur, an award-winning filmmaker, civil rights advocate and Sikh interfaith leader. Connect. The “Connect” day encouraged participants to connect with others. This day marked the 4 year anniversary of the hate-crimes that occurred in 2014. On this day, participants commemorate the lives of Dr. William Corporon, Reat Underwood and Terri LaManno. Adding meaning to the occasion, was the Holocaust Remembrance Day. Holocaust Remembrance Day was also acknowledged, serving to remember the lives lost during the Holocaust. You. While previous days had been focused on others, this day was all about the individual. The purpose was to spend time being the best version of you, taking care of yourself mind, body and soul. A self-defense workshop was provided, specifically for women, in case any woman should find herself in a dangerous situation. Go. The “Go” day inspired people to set out and be active in all aspects of their lives. A program took place in which people tried to find a common ground or similarities in order to work together and take action. Topics such as compassion, hospitality and caring for the Earth were discussed as well. Onward. On the final day, community members from all backgrounds were invited to attend the 2018 Make a Ripple, Change the World event. Hosted at the National World War I Museum walkers traveled two miles, symbolizing a shift forward and away from hate. 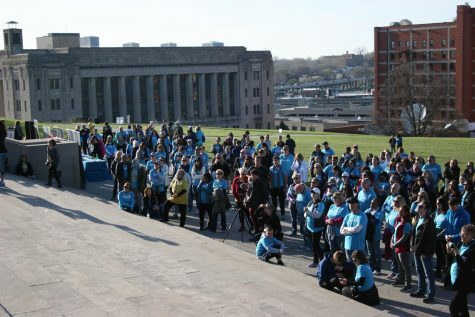 Thousands attend the walk and participate in all of these events each year. In addition, many speakers will present at the events as well. Jennifer Levison of The SPEAK UP Foundation was one of the presenters participating in the events. Levison participates in SevenDays each year due to her own personal friendship with Corporon and her desire to educate about suicide prevention. In addition to the speakers, volunteers were also needed each year for various jobs. Corporon believes that SevenDays has just begun to make it’s ripple and has just started to affect the lives of people in the Kansas City area. From adults to children, many people are just starting to take part in the movement, whether it be volunteering, speaking or walking. Corporon is glad that the movement is growing and that when people think of SevenDays, a smile comes to their face. She feels that when people participate, they feel as though happiness and kindness can overcome evil. Big or small, SevenDays has been making changes in our community and one day maybe the world.